The high-altitude sightseeing ropeway in Sanya Yalong Bay Tropical Paradise Forest Park is completed and was put into service on 15th Mar, creating a brand knew entertainment sport in Sanya scenic spots. Those who want to experience the feeling of flying freely like a bird can have a try in the Yalong Bay Tropical Paradise Forest Park. This exciting sport will shows you the beautiful tropical scenery as well as lovely costal scenes of Yalong Bay. The bidirectional high-altitude sightseeing ropeway is from Orchid Valley to the summit of the mountain in Tropical Paradise. The 590-meter ropeway only takes you 1 minutes and 10 seconds to slip from the summit to Orchid Valley. 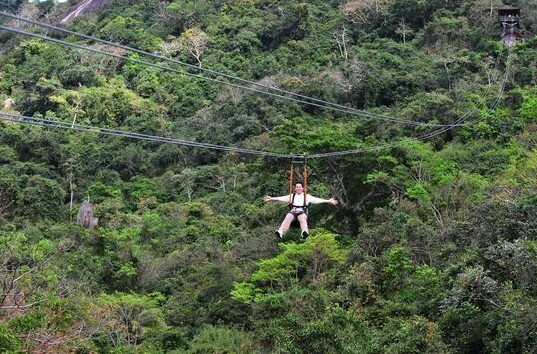 It is the first extreme sport in Sanya as well as the longest high-altitude ropeway in Hainan.